Brigitte Katelaan worked for ATV and TeleAruba as a producer. Camilo Romero worked for ATV as a cameraman. Both found dead by hanging within weeks of each other. ATV Aruba Broadcasting Co. N.V. I am no expert on hangings but can apply a bit of physics to this and as Cat posted, there are several things wrong with this photo. For one, where is whatever this man was standing on? I see his shoes neatly right under his body as though they were placed there, not kicked off in a violent struggle. There are calculations I would think a professional hangman would use related to length of rope versus body weight. The lighter the body, the longer the rope needed to break the neck or blood vessels to the head resulting in quick death. This man could just reach up and grab the beam to stop the pain as he would be very slowly choking, not hanged as from the sudden drop which results in unconsciousness. There is no drop, the rope is much too short so he would be slowly choking to death. No broken neck, nothing to stand on, no emptying of bladder, no signs of struggle, rope too short, clothing too neat. Still wish we had started that suicide thread for 2005 saw a huge number of deaths among very young people. Far too many, IMO, for natural causes. And I am sure there are those who will be quick to scold us for not respecting the privacy of this individual and his family but I think it more respectful to try to make sure there is nothing suspicious about this death that would indicate it was other than suicide. Concern is not attacking nor being disrespectful. Looks as though 2007 is off to as much crime as previous years and certainly more than we have been told in the past. These tourists were robbed not once but twice from their room safe! Several friends just returned from Marriott Aruba...it was either the Surf or Ocean Club where they own a timeshare and I'm not sure which place it was. Their friends that they traveled with (also timeshare owners at Marriott Aruba) were robbed from their in room safe not once during their week BUT TWICE. First time they stole $500 in cash and a digital camera. Police came...very slowly they said, friend lost nearly a day on the beach w/ all the paperwork etc. Marriott reiumbursed (sic) them the cash and camera. This time supposedly there was $1500 in the safe and some other things. Same deal...police, lost day on the beach etc. But Marriott has not settled that robbery with them yet. This has never happened to them in all of their visits previously. Marriott and police agree that it probably was an "inside" job. And that is all I know. Just posted this for informational purposes. Not bashing Marriott...it could happen anywhere. I love the Marriott. From the sound of it, they handled it approrpiately (sic) and most certainly want to get to the bottom of it as well. I don't think this has been previously posted. So many now it is difficult to keep up with them. I wonder if writing crime by date on index cards would help. STA. CRUZ – Ayeranochi den careda di 8.30 pa 9’or, a drenta un melding cu un persona a pone fin na su bida. Bisiñanan di ex Papiamento restaurant na Playa a mira un persona bisti full na blanco/beige drenta cura di e cas y despues a mir’e ta haciendo algo straño. Na ora cu menos nan por a pensa, a resulta cu un homber a pone fin na su bida. Despues di a averigua, Solo di Pueblo a logra confirma cu ta trata di Camilo Romero kende te cu diabierna ultimo a traha na ATV canal 15. Su funcion tabata truck-engineer ariba e truck di ATV y tabata responsabel pa transmisionnan. Camilo Romero a despedi di su coleganan recientemente y a bisa cu e lo bay Hulanda pa sigui curso of estudio. No ta conoci si Camilo lo por tabata tin otro tipo di problemanan. Solo di Pueblo ta extende palabranan di condolencia na su famia como tambe na coleganan di ATV. ORANJESTAD – Two teenagers seriously stabbed during torchlight procession. The incident took place near the Crystal Casino. One of the teenagers was stabbed in his chest and in his throat and lost a lot of blood. An ambulance rushed him to the hospital. The other teenager was stabbed in his stomach and punched one of his longs. He underwent urgent surgery and his situation is critical. The victims are 17 and 18 years old. The police are investigating the case. There's no trace of the culprit. Here's the entire article with the photos. Anna - Keeping up with all the crimes would be a full-time job! And the automobile accidents ... most days the papers have several photos of cars that look pretty much demolished. 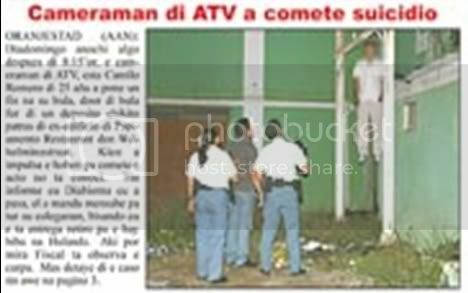 The second photograph of the latest suicide by hanging looks completely different that the first one. If not for the stats on the victim, I would think it was a completely different scene. In the second one, the rope does not appear short at all so the beam right about the head in the first photo must be from the angle as nothing is there in this second one. And he does appear to be wearing gloves which is not apparent in the first photo we saw. Oddly enough, the pants look dark in the second photo and light in the first in color. It further appears he jumped off the top on the building with rope attached to the beam beside it. That would give sufficient drop, etc. to cause instant or rapid death. But his shoes are directly underneath and that is strange as they look placed. This is a good example how the angle of a photo can make all the difference and the second photo look much more like an actual suicide than the first. I do believe that in most places suicide is against the law and therefore a crime so we should include as many of those as we find as well. It is the taking of another life, homicide of a form, even it it is their own life they take. The photo from the second article is of a LE officer...wearing gloves. IMO...The first article photo looks like someone hung a dead body there. I wonder what the connection to the restaurant is.....And if Camilo worked for TeleAruba also as did Brigitte. Anna - in that second picture I don't think we are seeing the guy who committed suicide. I think that's a police officer standing there. ORANJESTAD (AAN): Mundo di prensa audiovisual ta na luto na Aruba, ora cu un conocido productor di TV local a comete suicidio, Diamars merdia na su cas na Macuarima. Tabata algo banda di 3’or, cu e informe a drenta cu na Macuarima tin un persona ta horcando su mes e momento ey. Pero ora cu Polis y Ambulans a yega ya caba ta laat. Den patio net riba un cura di popchi, e dama Brigitte Christine Katelaan a comete e acto tristo aki, y asina autoridad a bin haye. Polis ni Ambulans por a haci nada mas. Pero demas autoridad halto a ser yama, y Departamento Tecnico di Polis a bin haci su investigacion. Banda di 3:30’or, Docter Brouwer a constata morto di e dama aki, kende a nace dia 3 di Mei 1970 na Hulanda. E dama di 36 aña aki ta trahando como Productor di programa na TeleAruba. 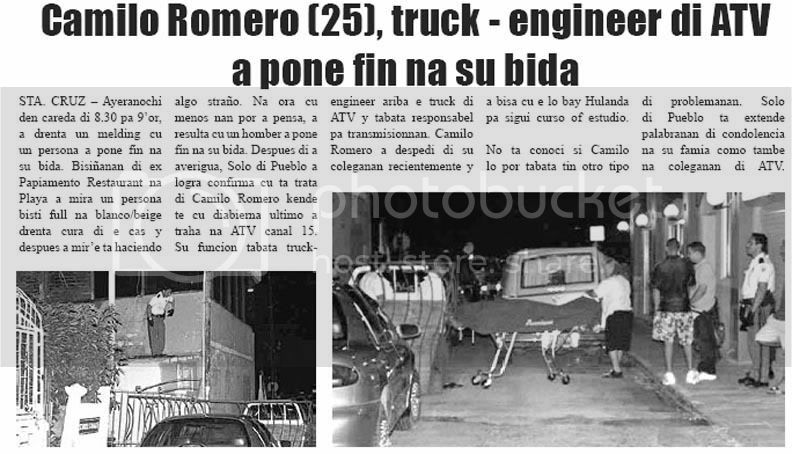 Anteriormente el a yega di funciona tambe na ATV, y prome cu esey tabata traha na Curaçao. E tin un yiu muher kende ta studiando actualmente na Hulanda, y sigur e noticia aki ta dal henter famia como un shock. Ningun hende a mira Brigitte den mal humor ultimo dianan aki. Semper e tabata un persona energetico, cu yen plan pa bida, y yen di idea di creatividad pa su programanan. TeleAruba mes a bay den luto desde Diamars atardi caba. Kico a pone Brigitte comete lo extremo aki? Ningun detaye ta existi si acaso tin problema na trabao. Pero ta varios storia a circula Diamars atardi y anochi, sinembargo e so sa di con el a haci esaki. Tin indicacion cu el a laga un carta atras, pero autoridad no por a confirma esaki pa DIARIO. Na su famia, y coleganan di TV, Matutino DIARIO ta expresa su mas profundo palabra di condolencia. I'll be looking forward to the summary. Thanks msmarple. Does not include all posts, but does include all violent incidents posted. In most cases, more detail is available on previous pages of this site – although not in chronological order, and there is duplication. 01/06/2006 - A report which is circulating in Holland caught Diario’s attention, related to a declaration from the High Command of the police in Utrecht. Among other things, it is mentioned that with suicide cases, it is desired for all these cases, that DNA tests be conducted on the bodies. 03/20/2006 – The ship Rachel S arrived in Aruba the Sunday of Carnaval Grandi with a dead person, Bernard Ramsaran, on board, and a local autopsy determined that the man died of natural causes (heart failure). However, an autopsy conducted in his country of Trinidad and Tobago disclosed that he died of traumatic asphyxia; e.g. strangled and choked. The body had visible marks of violence. As Diario asks, how did Aruba miss this one? (Interpol is investigating as a High Seas case.) Diario - also see rcharan@trinidadexpress.com . 06/23/2006 – Unknown woman found in trash pile; Bondia prints graphic photo of corpse. SM has photo. 06/? ?/2006 – Male corpse found floating offshore; reportedly a fisherman, wrapped in tarp. No further detail available. Diario ? 09/18/2006 – Diario reports that a public employee working as a bouncer at a night club battered a tourist who subsequently required medical attention at the hospital. The bouncer was arrested and fired. The tourist returned home. This may be a report on the 09/03/2006 incident above. A comparison to U.S. Murder Statistics for the year 2005 is on Page 7 of this thread. 06/10/2005 – Aru-Bay videotapes from afar, the curious incident of rock painting in broad daylight (!) by Visibility Police and Polis. Also captured in this tape is what appears to be the recovery of a body. It is eventually claimed to be that of a 7-yr-old illegal immigrant from Columbia, and also that the body “had been found” a year earlier. Why was he there, not in cemetery? SM has access to the videos, and still shots of questionable activity. 06/18/2005 – Rene Michel van Heyningen found at a cemetery; partially decapitated; wife and/or “companion” charged. 12/24/2001 – U.S. tourist “Marie” from Boston was dragged into a car as she was leaving Carols ‘n’ Charlie’s; the car drove away from the area and she was raped. As refererance, this was the report in October 2006. Thanks Slueth for that info! Thanks Anna for posting this. ONe more time for the October summary. The new summary for January 2007 should be posted at the top of page 16. Yep very interresting observations. Does not look right to me either. Page created in 5.431 seconds with 19 queries.